Apple on Monday June 10, 2013 announced a new version of its Operating System "iOS 7" at its World Wide Developer Conference in San Francisco. Apple has revamped and refreshed the overall design and feel of the operating system. Apple CEO Tim Cook called the new iOS "the biggest change to iOS since the iPhone," which was pretty similar to what Steve jobs said earlier ! However, a very large collection of new features were added to iOS, and you will notice that the new iOS 7 is completely different than iOS 6. 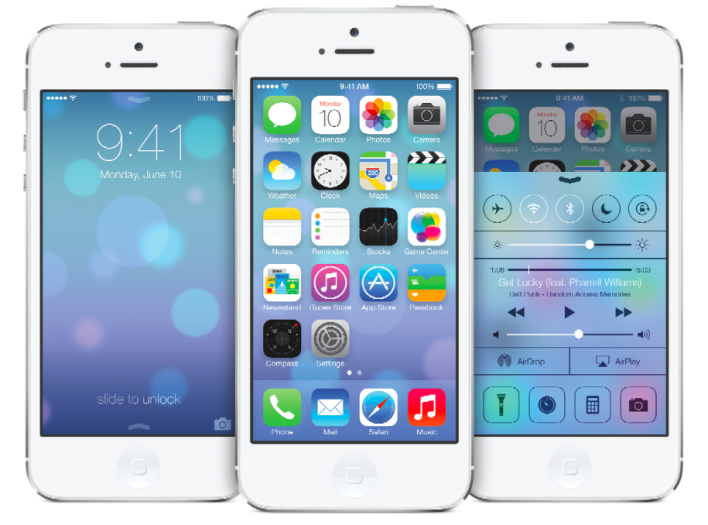 Now let's talk about the best features of iOS7. Finally, Apple is providing us with this control panel/center interface which is more like an easier-way-to-access settings area. Because of this feature, you will be able now to quickly tap options like "Airplane Mode" or access your Wi-Fi controls, and a built-in flashlight (it's a dream coming true <3), as well as media player controls. The new Notification Center can show all notifications, missed notifications, new "Today" view. And is going to be available from the lock screen as well. As you can see the notification center drop-down got a new makeover, where you can check and interact with your notifications from the drop-down notification center itself. Meaning, you can reply within notifications center for emails and messages, and delete it as well. Before, the multitasking interface was accessed by a double tap of the home button which gives you later a small line/rack of app icons running in the background. Today, it displays large windows showing the apps running in the background in a very different yet creative way. The new iTunes Radio aka iRadio is a streaming music service to compete with Panadora. This radio will be built on top of the iTunes music catalog. What Apple's iTunes Radio does differently is that it also ties you back to the iTunes store, allowing you to "wishlist" your favorites, and purchase those tracks you want to hear on demand. The app is free and ad-supported, but ads are removed for iTunes Match subscribers. The revamped photos app is something else ! Now the camera roll itself has been improved where your photos gets organized/classified into "moments" based on location, time, date, etc. AirDrop is a new way to share photos with other iPhone users. Now you can finally transfer photos to a friend nearby over Wi-Fi or Bluetooth with no wires, physical bumps, extraneous emails or iMessage. Not only this, but it will also support other file types like sending Passbook passes and contacts. The camera app has been updated with built-in Instagram-like filters, and the ability to swap between the different camera modes like "panoramic" or the new "square" camera view. Moreover, if you are a video recording type of person, you've got to love the new Apple's camera app, which purportedly shoots a video at 60 frames per second. The famous Safari got the chance to be revamped too, with fancy 3D-esque tab switching behavior, improved bookmarking, one-tap access to favorites, and even twitter integration which lets you see which links your twitter friends are reading and sharing. And better yet, you will no longer be limited with 8 taps only. Siri got a new Gorgeous interface, sound-wave displayed while speaking with a new voice. The new voice got a male and a female voices, which can now speak French and German with more languages coming in time. And can control more commands/options in your device, including playing back your voicemails, turning on or off things like Bluetooth, increasing or decreasing screen brightness and much much more ! Also, Siri's search option switched from Google to bing. I don't know if this is going to be helpful or not, but let's see. Mail, on the other hand, offers big, edge-to-edge photos when used for photo sharing and lets you take action on inbox messages with a swipe, which is a feature that earlier earned third party app like Mailbox. Not to mention the improved mail search. The weather app has major updates, and shows animated backgrounds reflecting current weather. The new look of the messages is awesome ! iMessage bubble icons for text no longer have shadows on theme, they are totally flat, along with many of the new features. I can't wait to put my hands on that new iOS, but I'd rather to wait until the new beta is launched, since you can't go back to the old iOS 6. I was expecting iOS.. but all I saw was a Windows Mobile design with Android features. For Apple history, this is a change itself! You are totally right we were all expecting great features, but this action will blow the minds of Apple fans away since its a completely new interface with new features that were not available in previous iOS versions.